Located on Gandy Blvd N near the intersection of 4th St N and S Frontage Rd, Extra Space Storage serves St Petersburg residents near Gandy, Pinellas Park, Feather Sound, and more. Locals will recognize our facility near Mobil and Sweetwater Kayaks. 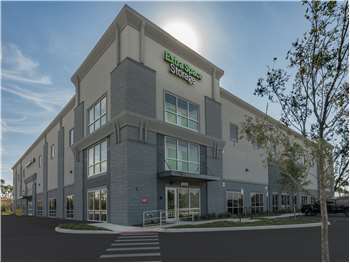 Extra Space Storage on Gandy Blvd N can accommodate residential and commercial storage needs in St Petersburg with a wide selection of storage units, climate-controlled storage, and exceptional security! Our St Petersburg storage facility offers units as small as 5x5 and as large as 10x30 with convenient features like indoor access, first-floor access, and elevator access. We have the storage unit for you! With advanced security measures like electronic gate access and 24-hour video surveillance at our Gandy Blvd N storage facility, Extra Space Storage provides peace of mind for customers. Keep delicate belongings safe from extreme heat and humidity in a climate-controlled unit. This amenity ensures your unit stays comfortably between 55 and 80 degrees year-round. Why do so many people choose Extra Space Storage? It's our dedication to dependable self storage and exceptional service! We maintain a clean, secure facility at all times, and our friendly, professional staff works hard to ensure your needs are taken care of. Contact us today to reserve a storage unit in St Petersburg! Drive south on 4th St N. Turn left onto S Frontage Rd. Take an immediate right onto Gandy Blvd N. Our facility will be on your right. Drive north on 4th St N. Merge onto Gandy Blvd N. Our facility will be on your left after Sweetwater Kayaks. Drive west on N Frontage Rd. Turn left onto 4th St N. Turn left onto S Frontage Rd. Take an immediate right onto Gandy Blvd N. Our facility will be on your right. Drive east on S Frontage Rd. Take an immediate right onto Gandy Blvd N after 4th St N. Our facility will be on your right.